ODD JOBS is an ongoing durational maintenance performance directed in part by the residents surrounding Burrardview Park, where Vancouver-based Lexie Owen is artist-in-residence through the Fieldhouse Studio Residency Program. The project sees Owen take up the role of caretaker in the neighbourhood directly surrounding the park, maintaining aspects of the neighbourhood deemed important by its residents. 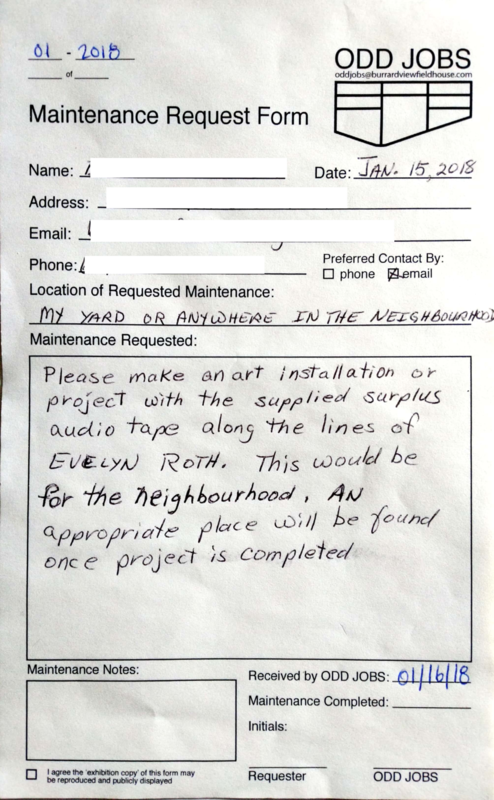 The Evelyn Exhibition is the direct response to a job request from a local resident: "Please make an art installation or project with the supplied surplus audio tape, along the lines of Evelyn Roth". In order to fulfill the job request, Owen has invited Vancouver artists Caitlin Chaisson, Liljana Mead Martin, Holly Schmidt and Lois Klassen to create artworks in response to the diverse practice of performance art legend Evelyn Roth. The exhibition will take place in and around the SiteFactory bus, which will be parked at the Burrardview Park Fieldhouse (545 N Slocan St) on Saturday July 28th, from 1-4pm. This event is made possible with generous support from the Burrardview Community Association and the City of Vancouver's Community Arts Grants. ODD JOBS, launched on Labour Day 2016 by Owen, is an ongoing performance-based work that creates a framework for engaging directly with the residents of the Burrardview neighbourhood through maintenance labour. Taking input from the community in the form of “maintenance requests” ODD JOBS is open to performing any type of maintenance deemed necessary by the community, from the pragmatic to the ephemeral. The project connects the legacy of the fieldhouses as living spaces for parks caretakers, with their current function housing artists tasked with ‘engaging’ the community. Taking the stance that all labour is equal, the project is interested in investigating perceptions of labour and privilege, particularly in relation to what types of labourer are recognized as having the capacity to “engage” a community. The ODD JOBS project exists in multiple forms, for multiple publics. The residents of Burrardview encounter it as an ongoing performance, one that they have agency to direct, or sometimes as an ephemeral installation or sculptures, while publics further afield encounter the project through photo-documentation, as performance-for-video, or on instagram. Lexie Owen is an interdisciplinary artist who lives and works in the unceded Coast Salish Territory known as Vancouver, BC. With a practice that bridges disciplines, Owen’s work explores notions of labour, visibility, legitimacy and the strange particularities of living with, and attempting to claim agency within, the structures of late-capitalism. Currently she is an artist-in-residence with the City of Vancouver at Burrard View Park Fieldhouse, and is the curator and project director of the itinerant community-based gallery space WNDW. Owen holds both a BFA in Critical + Cultural Practice from Emily Carr University of Art + Design and a diploma in Jewellery + Small Object Design from Kootenay School of the Arts. Recent and upcoming exhibitions featuring her work include JOINT EFFORTS, Harbour Front Centre (Toronto, ON); FIELD GUIDES, Roundhouse Exhibition Hall (Vancouver, BC); In The Hole, PAVED arts (Saskatoon, SK); Break the Legs of What I Want to Happen, Access Gallery (Vancouver, BC) and Fresh Paint, New Construction, Art Mur (Montreal, QC). Liljana Mead Martin is an interdisciplinary artist based in Vancouver, British Columbia. Martin explores the boundaries and mergence between urbanism, ecology, architecture and the body. Investigation into embodiment, residential space and questions around displacement and belonging are based in her lived experience of growing up a tri-national citizen between Canada, the U.S. and Australia. She develops site responsive projects through drawing, sculpture and performance. Martin is a co-founder of Hyphenated Sites and has exhibited and performed at the Charles H. Scott Gallery (Vancouver), Recess (NYC), and the Banff Centre for Arts and Creativity. Martin holds a BFA from the Nova Scotia College of Art & Design ('10), and MFA from Emily Carr University of Art + Design ('16). Caitlin Chaisson is an interdisciplinary artist, writer, and curator based in Vancouver, British Columbia. Her socially responsive drawings, performances, installations and curatorial projects explore relationships that shape both singular and social bodies. She is the founder of Far Afield, an artist-led initiative that supports regionally-connected artistic and curatorial practices, and has exhibited and published in venues and journals across Canada. She has studied at the University of British Columbia, the University of Brighton, and Emily Carr University of Art and Design, and holds a Bachelor's of Commerce with a Minor in Art History and a Master's of Fine Arts. Lois Klassen, PhD (ABD) is an artist, writer and researcher. She is known for intricate long-range projects that invite and engage participants in collective actions. Many of her projects, like Comforter Art Action and Reading the Migration Library, address social and political concerns – deliberately facing ethical demand with social, aesthetic and material methods. Her research investigates the ways that artists, who use social art practices and participation in their work, might understand ethics. Klassen is a lively participant and eager collaborator in Vancouver’s art, performance art and media art happenings. Her writing has taken on such wide-ranging topics as the public impact of performance art, the relevance of art coming out of nowhere, and migration. The open network practices of the 1980s and '90s had a large influence on Klassen’s emerging art years. Renegade Library, a major mail art project that she produced in the '90s, is currently being acquisitioned by international archives and collections. Klassen's work has been hosted and supported by institutions in the US, Canada, Mexico and the UK. She is as a Research Ethics Coordinator at Emily Carr University, and is currently a doctoral student of Cultural Studies at Queen’s University in Kingston, Ontario. To address the problem of textile recycling & reuse around the home, Lois Klassen will bring a Comforter Art Action to The Evelyn Exhibition. As with other Comforter events, this action will involve up-cycling gently used fabric into a blanket for use in a local shelter. At this event the blanket will be made from an oversized costume, originally designed and constructed by Leah Weinstein and Cindy Mochizuki. The action will also involve sharing know-how about domestic textile waste management. If you have a story or experience or idea for how to limit textile waste at home, bring it along so it can be shared with others. Klassen will compile the results in a small publication for future circulation. Holly Schmidt is a Vancouver artist with a research-based practice that engages processes of collaboration and informal pedagogy. Moving across disciplinary boundaries, she explores the relationships between practices of making, knowledge creation and the formation of temporary communities. Her exhibition, public art and residency projects include Pollen Index (2016) Charles H. Scott Gallery, Till (2014/15) with the Santa Fe Art Institute Food Justice Residency, Mess Hall (2013) Banff Centre Residency, Moveable Feast (2012) Burnaby Art Gallery, Grow (2011) Other Sights for Artists’ Projects. Upcoming projects are Midnight Picnic (2018) Boca Del Lupo, Locals Only (2018) AKA Gallery, and Accretion (2018) 10 Different Things with ECUAD Living Labs, City Studio and Vancouver Public Art. Born on December 27, 1936 in Mundare, Alberta, Roth studied art, dance, and fencing while living in Edmonton in the 1950s. She moved to Vancouver in 1961, where she became an active participant in the city’s art scene, particularly Intermedia Society events. During this time, she also worked performatively with Helen Goodwin’s dance company, TheCo. A multimedia community artist, Roth uses discarded materials to create large, soft, frequently interactive sculptures and environments. In 1990 she set up the Evelyn Roth Celebration Centre in Point Roberts, Washington, USA (artists' studios, art gallery and Performance space). This large studio allowed her to expand inflatable structures into mazes, set up a Festival Arts website and promote her work worldwide. She has lived and worked in Australia since 1996.